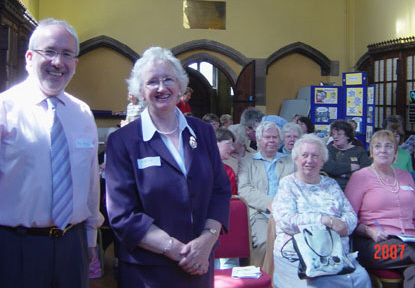 The picture above shows Rosemary Kempsell speaking on 25th June 2008 at the Stirling Roadshow, organised by our Provincial President, Sheila Redwood and the team from Mary Sumner House in London, to launch the Mothers’ Union resource [home]. 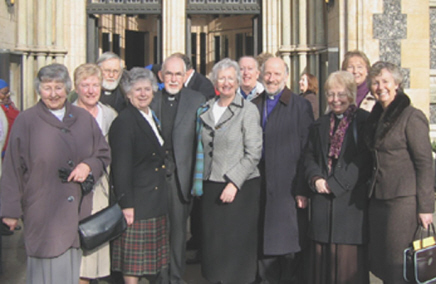 Over 30 countries from the Anglican communion were represented at the 2005 meeting of Mothers’ Union Provincial Presidents. They shared sessions on the visions and marketing of the Mothers’ Union as well as the empowerment of women and communication. All the Diocesan trustee's came together in Perth recently and picked up quite a few hints on charity law and how to be a good trustee from the MU Chief Executive Reg Bailey (left in picture with Sheila Redwood, Provincial President). The service in Southwark Cathedral on 1st February was truly memorable. A packed cathedral with an atmosphere of expectancy, excitement and joy, blessed by the most wonderful spring like day with not a cloud in the sky. There was lots of music and singing, the bells pealed out and the Archbishop was positive in his support for the MU and in what we do. It was a memorable start to the Triennium and an endorsement for Rosemary and the new Trustee board to carry on the work of the MU worldwide. 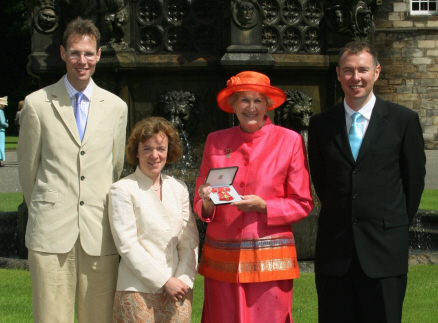 Trish Heywood's work as World Wide President of the MU for the last 6 years, has been recognised by the award of the OBE. 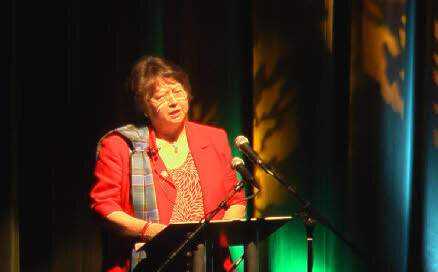 She has led a trustee board that reflected the overseas nature of the organisation and flown over 200,000 miles to visit members from India, Melanesia, Papua New Guinea, Thailand, New Zealand, Australia, Canada, Myanmar and 10 African countries as well as travelling Britain and Ireland extensively. Members in Scotland are proud that 'one of our own' has made such a contribution to the work of the society and think the honour is richly deserved. 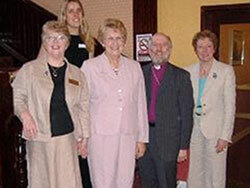 This was held in November 2006 to celebrate the work of the MU in Scotland and also in thanks for Charmian Paterson’s leadership as Provincial President, and the dedicated service she has given for the last 6 years. 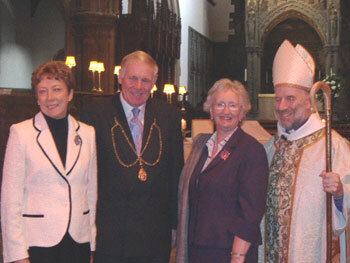 The service was a beautiful moving occasion held at St.Ninian’s Cathedral, Perth and was conducted by Bishop of St. Andrew’s. 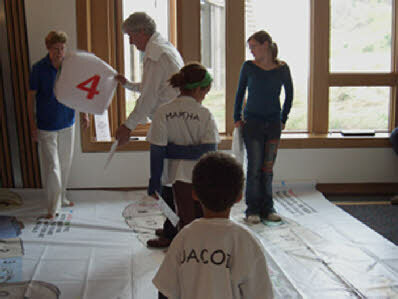 The Millennium Development Game was used during the Festival of Politics, a three day event held in the Scottish Parliament during the Edinburgh Festival in August. there are many informal links through aid organisations, schools and the like. The game belongs to the MU and was extremely well received, several participants hope to hire it for their own organisations. It can be booked by phoning MU in London 020 7222 5533. 130 members and friends came from across Scotland to hear Marketing Co-ordinator Jean Price and Head of Marketing Vikki White speak about the MU 5 Objectives and how they were interpreted by members in different countries around the word to empower women and transform lives. 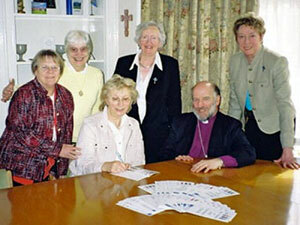 The Fife Contact Centre is a Mothers' Union initiative working with and funded by statutory and volunteer agencies. The centre pays a part time organiser and an assistant administrator, so a regular income is essential. We also rely on a team of trained Volunteers. Fife Contact Centre is affiliated to the Scottish Network of Child Contact Centres and operates within its code of practice. If you would like to become a friend of the Centre and for more information contact Lesley Brooke Diocesan President for details click here. 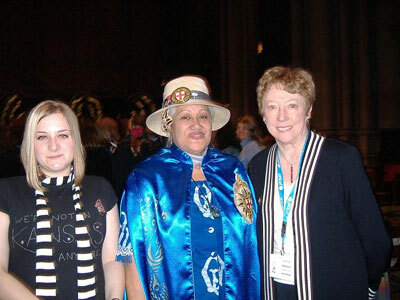 Charmian Paterson was a delegate representing Scotland at the UN Commission on the Status of Women 2006 in March. 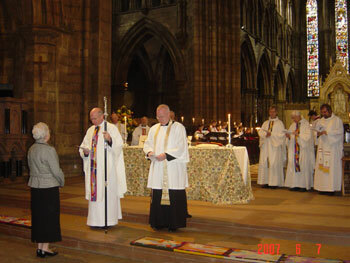 She went as a representative of the Episcopal Church to the Anglican Consultative Council. The MU had also sent delegates. The MU and ACC had sent in statements on the above themes. The ACC gathering was supervised by Archdeacon Tai, who is the Anglican Observer at the UN. They heard presentations from Sudan, Jerusalem and Pakistan where the Christian Church is persecuted and the women begged for our prayers. Every day was filled with briefings and listening to the discussions by the different governments' representatives on drafts for the final agreement.